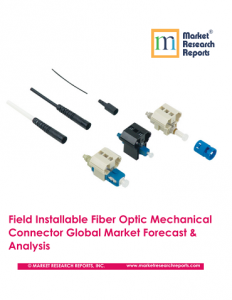 New market research study covering field-installable fiber optic mechanical connectors covers Furukawa, Belden, CommScope and other players in report. Report reviewed the product offering of over 100 vendors competing for the global fiber optic installation apparatus market, which includes fiber optic connectors, cable assemblies and other components. From the 100 vendors, we selected 28-companies, which offer field-installable fiber optic mechanical connectors, to profile in this report. Report identifies two primary technology solutions to field-install a fiber optic connector: fusion splice-based technology (splice on connectors); and mechanical-based technology, which are mostly mechanical splice- or crimp-type. This new report, presents the forecast of the use of fiber optic mechanical-type connectors in field installations (inside or outside plant). In terms of volume (quantity/units), the worldwide consumption of field-installable fiber optic mechanical connectors reached an estimated 29.55 million units in 2017. The worldwide connector quantity is forecast increase with solid double-digit growth over the next 10-years. The market forecast is segmented by single-mode and multimode SC, LC, ST, and FC connectors. Field installable mechanical connectors, which are used with multimode optical fiber, are forecast to eventually lead in quantity, ahead of single-mode connector volume, as optical fiber penetration in private data networks (led by multimode-optical fiber) continues to increase during the forecast period (2017-2027). Single-mode connector growth will be driven primarily by the aggressive deployment of fiber and associated apparatus in the metro/access Telecommunication networks, as well as Private Datacom Local Area Network (LAN) extension applications (campus: building-to-building). The volume of field-installed mechanical fiber connectors was led by the Asia Pacific (APAC) region in 2017. The average selling prices are typically much lower in the Asia Pacific region versus the other regions; therefore, the America region was the market share leader, in terms of consumption value, beating-out the APAC region. In terms of volume (the number of connectors), the EMEA region (Europe, Middle East and Africa) held an 18.2 percent relative market share in 2017. Fiber optic field termination is required in both inside-plant applications and outside-plant applications. Increasingly, space to allow for connectors, splices (mechanical or fusion splice-sleeves, enclosure (boxes/cabinets/pedestals), panels, splice trays, or excess fiber optic cable is limited; therefore, next-generation solutions must adhere to these apparatus size limitation concerns. The introduction of (fusion) splice-on connectors and self-contained patch and splice modules have increased the options that companies can use to cost-effectively connect their plant in the field. Additionally, mechanical connectors (crimp or splice-types, which incorporate index-matching gel to join the fibers) are used to increase installation/repair speed and reduce cost. A growing segment of the connector market, particularly premise data application, depends on an involved distribution network consisting of distributors and value-added providers such as cable assembly houses who then sell to installers. Successful connector manufacturers keep a close tab on their major end users and installers and their specific requirements.